While March Madness sweeps through Princess Polish, we're coming to the tail-end of the 30 Days of Zoya Challenge and giveaway! Today features a polish I snatched up in the New Years promo, not knowing it would be discontinued shortly thereafter: Veruschka. 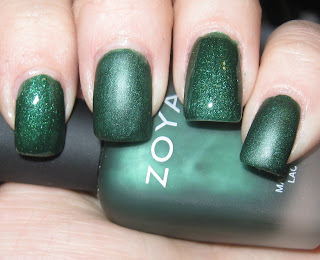 Zoya Veruschka is a matte forest green shimmer that I actually do not mind wearing. Most other mattes are completely dull and remind me of old cars. This one has a glow about it, even without a gloss. Though of course, I do like it glossy better. What about you, ladies? Glossy Veruschka or Matte Veruschka? As of this moment, Day 29 is going to feature another wonderful guest editor. 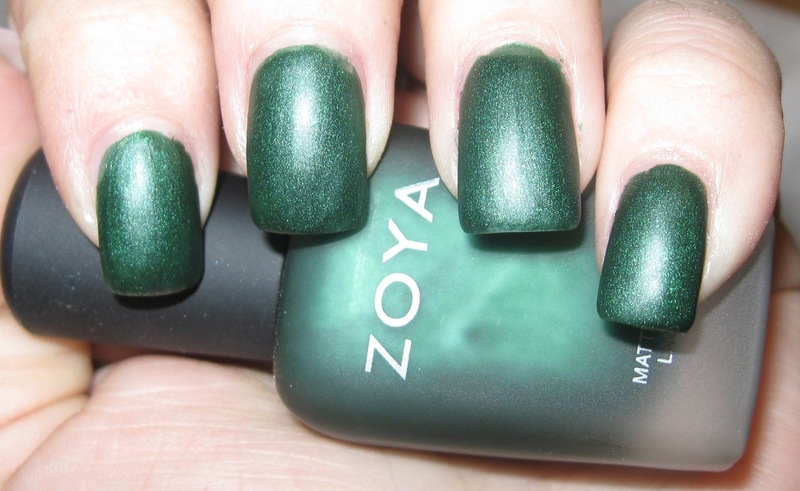 So unfortunately, it is time to pick the last color for our 30 Days of Zoya Challenge! I'm due to receive Tru, Skylar, and Lotus any day now, as well as Opal, Maisie, and Chloe. So pick either Tru, Skylar, or Lotus and it will get the full fleck effect treatment! Tru! And, much to my surprise as a non-fan of matte, my favorite look for Veruschka is actually the alternating glossy/matte you are sporting in the last photo. A cool effect! Skylar. I love that color. Lotus! I'm loving Veruschk, both ways. To answer your question, I think I prefer it glossy; well, at least today I do. I have never tried any matte polishes, but I prefer Veruschka glossy. Lotus for the last day!!! I honestly just love Veruschka in all her forms. lol I really wish I would have been able to snag her. Darn money issues. I'm going to vote for Skylar. I'm trying to decide on whether or not I want her, so it would be great to see your opinion on it. I think Veruschka is lovely no matter what you do to her! I just recently ordered Tru, so I'd like to see that swatched. Honestly, now that I've just seen Savita's picture...I wish I had purchased her too! Next time before I purchase, I'm going to look at swatches on REAL NAILS!!! You just can't tell the look by seeing the bottle OR that little round circle on their website! Thanks!